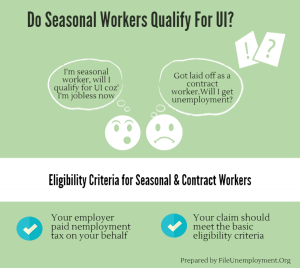 Who are seasonal and contract workers? 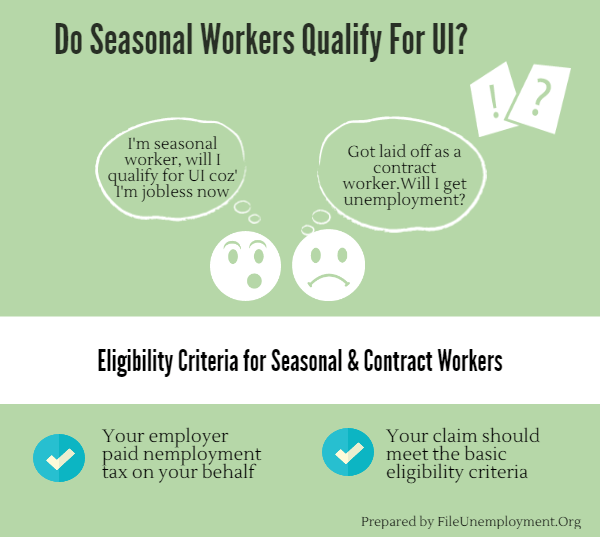 Seasonal, contract workers and temporary employees who are hired for a fixed term or have a job opportunity only during a particular season. These days, taking up a fixed term work has become quite common in many countries. Fixed term work usually falls into one of the following two categories. While seasonal jobs too are for a certain period, they are not exactly similar to contract jobs. Jobs like being a tourist guide, athlete etc fall into the seasonal category. Both these types of workers often find it difficult to find a livelihood when the term or season is over. Unfortunately, not all states pronounce them eligible for UI benefits. **If you are someone who has benefit weeks remaining in your UI account and would like to claim the balance, read our insightful guide on How to re open unemployment claims before contacting the state unemployment insurance agency.Suggest this to a friend or family member if they are in a similar situation. Whether or not seasonal employees are covered by unemployment insurance is a matter that is decided by individual states. Generally, if the employer pays the relevant taxes into the system that contribute to UI funds, a seasonal workers can claim UI benefits. In most cases the benefits are denied if the employer declared themselves as a seasonal company and do not pay into the system. Contract workers are typically entitled to UI benefits because companies pay the relevant taxes into the system. Federal and state taxes and worker’s compensation tax component are paid by businesses who hire contract workers. However independent contractors are usually not eligible to receive unemployment benefits. This is due to the fact that companies who hire them do not pay the taxes that contribute towards UI fund. Both seasonal and contract workers must have worked for the state mandated minimum hours and earned the minimum pay during base period to be eligible. They should also prove that their lack of employment is due to no fault of their own. For further details on eligibility criteria, contact your state’s unemployment insurance agency. Tip: Use our simple and quick Eligibility Calculator to check your eligibility before applying. We generally encourage every unemployed person to file for benefits as soon as they are unemployed. We suggest the same in case of seasonal and contract workers too. To apply for unemployment benefits, the contractor or seasonal worker must not have quit their previous job. Should they be unemployed for any reason other than lack of work or through some fault of the employer, they may be denied benefits. Number of weeks and hours worked varies from state to state, so make sure that you contact your state’s unemployment insurance office before you set about filing your claim. You will need your employment history which includes duration of work, wages earned and details of your ex- employers. You will need your social security number and some other important documents as well. Once you have gathered all this, you can proceed to file your claim via telephone, Internet or mail, although we suggest doing it through the Internet as it is faster. Being unemployed can be a difficult time for anyone. Along with filing for benefits with your state, you must also make sure that you actively search for new opportunities as it is difficult to survive on the benefit amount provided by the state alone. Seasonal and contract workers usually have the benefit of possessing a unique skill which often makes them valuable work force. Stay positive and spend time with your family and friends. We sincerely hope that you will find greener pastures soon. Good luck! Are Businesses Struggling to Find Workers?